There are very few things that rival the intensity and pain of a migraine headache. Maybe a bad toothache or a gut-curling stomachache can compare to the pain, but most times when people develop a migraine whatever they’re doing has to stop, as a migraine or bad headache can force you into immediate inaction and make you seek out refuge through medication, hospital visits or just turning out the lights and lying down. If there is one positive for adults suffering from migraines it’s the fact that most can properly communicate to their physicians just what type of symptoms they’re experiencing. But unfortunately for children it’s a whole different story, as many times they’re too young to articulate what they’re feeling so migraines go untreated for long stretches of time. And in a lot of cases excessive crying, lack of focus and poor grades in school are attributed to other things besides the actual problem, experts say. A recent study conducted by researchers found that children who develop episodic migraines were 30 percent more likely to perform poorly in school compared to kids who don’t suffer from migraines at all. Dr. Lenora Lehwald, a neurologist in Columbus Ohio told Fox News that it’s imperative for migraines to get diagnosed immediately in children, as early detection will have a direct impact on the effectiveness of future treatments. Dr. Andrew Hershey, of the Cincinnati Children’s Hospital Medical Center agrees and suggests that many parents don’t take children’s headaches as seriously as they should, and once the illness impacts school attendance or academic achievement the migraine has been untreated for far too long. Researchers at Merck & Co. in Whitehouse Station, N.J., examined over 5,600 Brazilian children ages 5 through 12 and learned that 0.6 percent had chronic migraines, 9 percent had occasional migraines and 17.6 had possible migraines. Lead author of the study Marcelo Bigal says both parents and school administrators need to add the issue of child migraines and headaches to the general school discussion as it pertains to poor academic achievement and students having problems in school. “Studies have looked at the burden of migraine for adolescents, but less work has been done to determine the effect of migraines on younger children,” Bigal says. “With approximately one-fourth of school-age children having headaches with migraine features, this is a serious problem, especially for those with frequent, severe attacks that do not subside quickly. Parents and teachers need to take these headaches seriously and make sure children get appropriate medical attention and treatment,” said Bigal. What’s challenging sometimes for children, who suffer from migraines or any other episodic illness, is convincing their parents that they’re really sick. Whether it’s due to the child falsely crying wolf in the past or kids seeming to be ill one minute and perfectly well the next, parents can easily get skeptical and not take the illness seriously. So the next time your child says they’re suffering from a headache or stomachache it may be something that needs quick medical care. 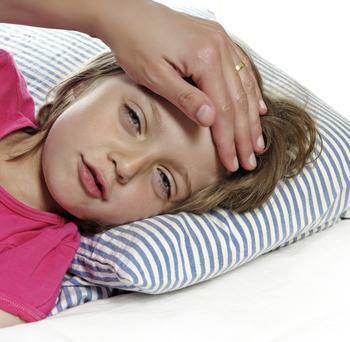 A separate study found that certain types of migraines can cause abdominal pain, and many times if children are complaining of constant and severe stomach discomfort, it could be more than the child wanting to stay home from school. Researchers in this study examined the medical records of 450 kids suffering from chronic stomach pain, and found that four out of 100 children suffered from abdominal migraine and 11 out of 100 had probable cases of it. Although the number of children with abdominal migraine wasn’t high, the study authors believe that many cases go undiagnosed and a lot of parents aren’t attributing their children’s stomach pain to anything severe or migraine-related. “There are lots of kids that have recurring unexplained abdominal pain,” said Dr. Donald Lewis, co-author of the study.